زى اكس سپكتروم (انجليزى:ZX Spectrum), ده كومبيوتر بريطانى, نزلت الكومبيوتر فى السوق سنه 1982, واتوقفت الاصدار نهائى سنه 1992. ↑ BBC News (23 April 2007). "How the Spectrum began a revolution". Portland Place, London, W1A 1AA, England, UK: British Broadcasting Corporation of Broadcasting House. Archived from the original on 12 January 2009. Retrieved 31 March 2015. 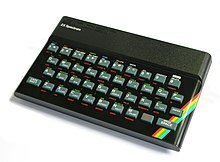 The Spectrum's reign as the UK's most popular computer was brief but its legacy and the affection in which it is held remains to this day. ↑ Klooster, Erik. "SINCLAIR ZX SPECTRUM : the good, old 'speccy'". Computer Museum. Archived from the original on 11 May 2006. Retrieved 19 April 2006.